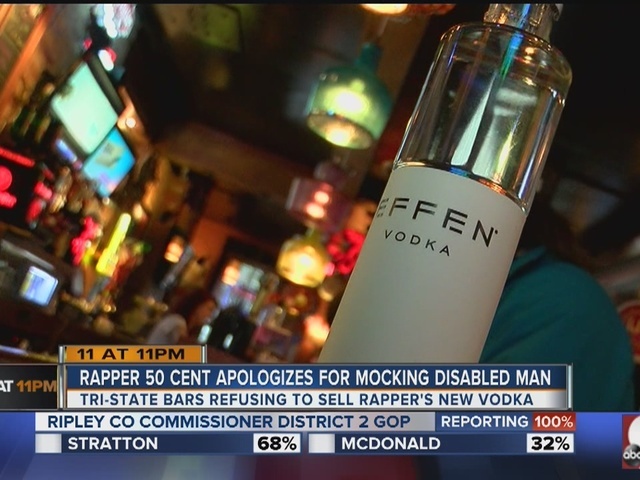 CINCINNATI -- Rapper 50 Cent has donated $100,000 to Autism Speaks to make up for mocking a Cincinnati-area airport custodian this week, the worker's father told our Scripps affiliate WCPO Thursday. "This is 100% confirmed," Kent Farrell said in an email. "Just got off the phone with Autism Speaks in their national headquarters. Have the check in hand." The family of Andrew Farrell had asked 50 Cent, whose real name is Curtis Jackson III, for a $10,000 donation and an apology. The apology came Tuesday, Kent Farrell said. "While the incident at the airport resulted from an unfortunate misunderstanding, please accept my sincere apologies for offending you. "It was certainly not my intent to insult you and I wish you and your family well." The apology came on letterhead belonging to G Unit Records, a label Jackson founded. "We would first like to thank everyone for the amazing amount of support that they have shown over the past few days. It has been an emotional roller coaster that we are ready to put to rest. As requested we have received a letter apologizing for 50 cent’s behavior and we have chosen to accept it, along with a request that a donation be made to Autism Speaks. Though a letter of apology will not undo what 50 cent has put our family through, we are choosing to forgive. A great lesson can be learned from this heartbreaking situation. Regardless of the way that another person appears to you, it is never okay to publicly humiliate them via social media. We hope that this situation brings more awareness to what people with autism and other forms of social anxiety suffer through on a daily basis. Again, we thank the growing number of supporters who have shown both love and acceptance during this difficult time." Jackson drew fire for ridiculing the 19-year-old Farrell and accusing him of being high on drugs while he was on the job at the Cincinnati/Northern Kentucky International Airport over the weekend. Farrell, who graduated from Conner High School last year, has a hearing impairment and social anxiety disorder. He said he wasn't on drugs and had just started his shift when Jackson followed him. Jackson was in Greater Cincinnati for a bottle-signing event at Jungle Jim's Eastgate for Effen brand vodka. He had appeared earlier this year at The Party Source in Bellevue, Kentucky for a similar event. Both Jungle Jim's and The Party Source, along with many local bars, pledged to stop selling Effen because of the incident. This isn't Jackson's first time to offend people with insensitive comments. He publicly apologized in 2012 for mocking a fan with autism. "Thirteen-year-old Butterball takes readers on a journey through the moments that made him into the playground bully he is today. Loosely inspired by 50 Cent's own adolescence and written with his teenage son in mind, Playground received wide critical praise--and is now poised to become a perennial classic." The book has 4.6 out of 5 stars on Amazon.